The developer of 5775 Collins Avenue will try again to get approval for a proposed new building to replace the existing Marlborough House. Following a summer of community opposition and a 3.5 hour Design Review Board hearing in September, the development team will be back to seek sign off on a proposed 17-story, 89 unit building that would run parallel to Collins Avenue. It would replace the 12-story, 107 unit Marlborough House which sits perpendicular to the street. The building’s orientation – parallel to Collins Avenue – is what has created the most angst. Residents of the Royal Embassy across the street from the proposed building as well as City staff have sought a reorientation of the structure from parallel to perpendicular to allow for greater view corridors. In its most recent memo to the DRB, Staff acknowledges the plans include greater than minimum front and rear yard setbacks and notes a new revision for a five-foot greater setback on the south side of the property than first proposed. However, they continue to express concerns about the proposed building’s “negative impact on maintaining important view corridors” and reiterate their recommendation to rotate the building. 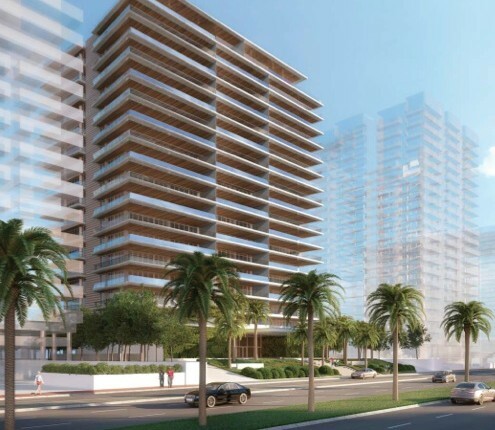 “A more slender, modest profile for the building as seen from Collins Avenue is strongly recommended to allow for expansive views of the water and allowance of sunlight and ocean breezes,” they conclude. At the meeting in September, developer’s attorney Michael Larkin indicated settlement agreements had been reached with the buildings to the north and south – Villa di Mare and L’Excellence – making a rotation of the building problematic. He told the Board there would be an even larger group of residents opposed to the project if the building’s orientation were changed “so that is not an option for us at all”. One major item of contention appears to have been resolved. Since the September meeting, the developer has included public beach access from Collins Avenue via a 15 foot passageway. Given their concerns about the building orientation, however, Staff is recommending another continuance until the DRB’s February meeting.